Password Safe supports administrators and users by automating repetitive tasks. These are represented as system tasks. Predefined tasks can thus be carried out at freely defined intervals. The following options are required for managing system tasks. 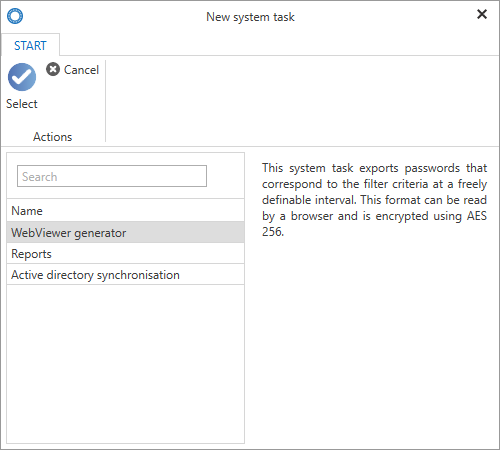 HTML WebViewer export: Exports a freely definable selection of records in an AES-256 encrypted HTML file. The file is saved in the form of notifications. Reports: Automatically creates a report that is issued in the notifications. This requires a report request to be created in advance. Active Directory synchronization: The comparison with Active Directory can also be automated via system tasks. This requires an active directory profile to be created in advance. It is important to note that only the Master Key profile can be automatically compared. 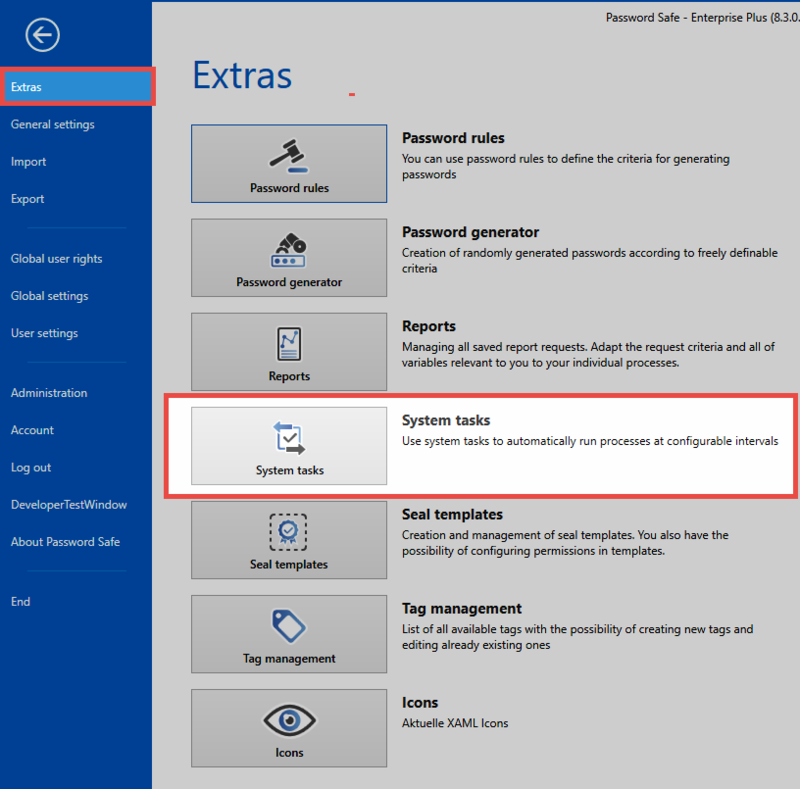 System tasks can be initiated as usual via the ribbon or also the context menu that is accessed using the right mouse button. The desired process to be automated using system tasks is then selected from the four above-mentioned work processes. Naturally, the four work processes also share some similarities in their configuration. Status: The system task is normally activated and then starts immediately after it has been saved according to the defined intervals. If the system task is deactivated here, it is still saved but is not yet activated. Interval: The interval at which the system task should be executed is defined here. All increments between every minute and once only are possible. It is also possible to enter an end date. The differences between the four work processes to be automated are described below. 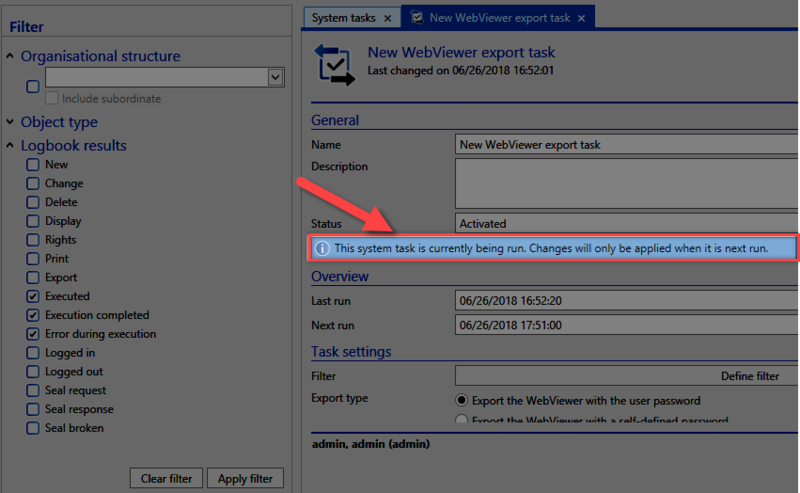 These differences are always part of the task settings within the system task form – the example here shows an HTML WebViewer export to be configured. Filter: The passwords that should be exported are defined using a filter. Password: The HTML WebViewer creates an encrypted HTML file. The password is defined here and must then be confirmed. Report request: The report requests defined in Reports are available and can be selected here. The Discovery Service scans the network and lists all of the services for which a service user has been saved. These can then be maintained using Password Safe. The information collected can then be directly transferred to the Password Reset for this purpose. *The Active Directory profile required for the synchronization is selected from those available. The Emergency WebViewer export creates an encrypted HTML file that contains all passwords. In an emergency, the data required to get the system up and running again can be accessed in this file. *Tags could be defined for individual tasks – yet they have no relevance and can also not be used as filter criteria in the system tasks. 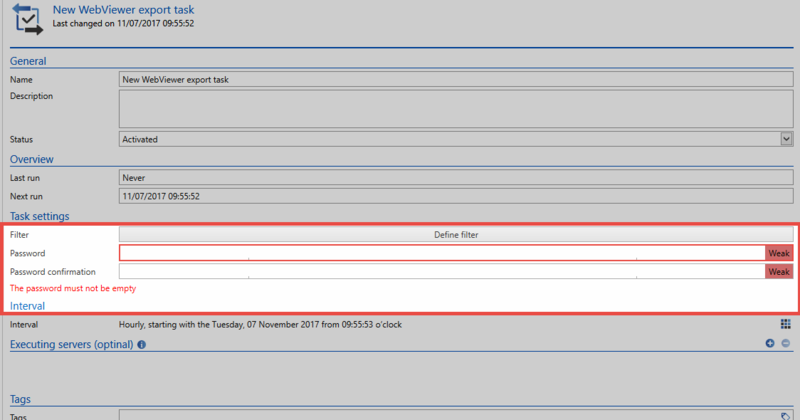 A corresponding note will be displayed to indicate if a task is currently being executed.